What a great night of racing at the Flat Rock Speedway on August 28th. Our friends at “The Rock” gave us another night after losing out to Mother Nature on June 5th. Longtime Club member Mt. Clemens “Old Timer” Doug Parsells was our MARFC Member Drawing winner. 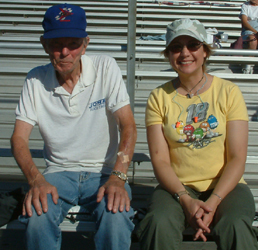 Doug has been a Flat Rock and MARFC supporter for many many years. It was great to see lifelong race fan and former MARFC Board Member Bill Palmer out at the races this night as Bill has been under the weather for a quite while but was able to get out and enjoy a night at the races with his son and Board Member Jeff Moroni. Back in June we had been able to present the MARFC Helmet Bag to Harold Davis Jr. So we were able to just plain have a night to enjoy the races. Many thanks to Scott Schultz, Ron Drager, and the staff at Flat Rock for having the club out again for a full night of racing. 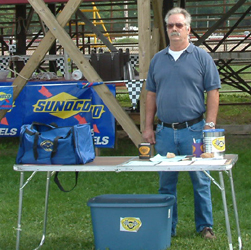 Also a big Thank You Flat Rock/Toledo Announcer Gary Lindahl for all the great PR. Gary’s style of announcing and knowledge of the sport shows why he is a member of the Michigan Motor Sports Hall of Fame. Table helpers for the night were Jeff Moroni, Laura Tucker, Sue Ginter, Larry Iacoboni, Paul Anton, and Cory and Steve Russell as well as yours truly. Thanks gang we really appreciate your help. I also want to Thank “Wild Bill” Barnhart for having the MARFC signs on his truck as he used it as the pace car this past summer at Flat Rock, it is always great to have that much exposure for the club. Well, our fan club days are all but done for the year and season championships have all but been wrapped up so it looks like we are in the twilight of yet another racing season. I will say that it has been a great season with plenty of hot weather although we have had our share of rain. Good for farming but bad for racing. We were able to welcome in the Whittemore Speedway and welcome back the Springport Motor Speedway this year and returned to so many of our longtime member tracks. I wish to say Thank You to all of our tracks that hosted a MARFC Day this past summer we really appreciated it and had a blast. As we move on into the fall, we want to remind you to sell your raffle tickets and if you need anymore don’t hesitate to call me at 586-465-7046 and I’ll get you some more. We have a group putting on a 25 year reunion for the old Mt. Clemens Race Track on December 4th in Mt. Clemens. Contact me if you are interested and I’ll get you in touch with the event organizers, Terry Bogusz Jr. and Laura Tucker. Tickets will be $25.00 and will feature an open bar and buffet meal. Received some sad news out of the Mt. Clemens Race Track community! Paulette Escalante passed away at the end of July. Many will remember Paulette as the driver of the #70 Camaro in the Powder Puff Division. Paulette always put on a great show and didn’t give an inch on the race track. She won many features and was the champion of the division as well. Paulette was always excited and jubilant after winning a race and she conveyed that to her fans and friends as well. 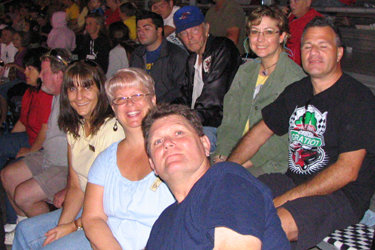 Paulette will be sorely missed by her sister Judy who was also a winning and championship driver in the same division. Many will remember Judy as Judy Brodeur or Harm. I remember the fun times we all had and pass along the club’s condolences to Paulette and Judy’s family, keep them in your prayers. 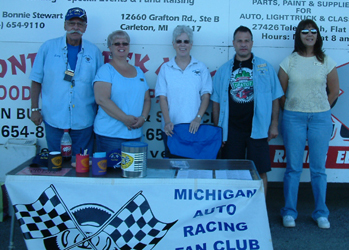 Get out to some of the fall specials and take in some great year end shows and as always, get ready for our winter time monthly meetings and the banquet in January 2011. MARFC at the Merritt Speedway! Merritt Speedway 8-7-2010 Another outstanding night of racing on the dirt at the Merritt Speedway! Great three wide racing all night long! 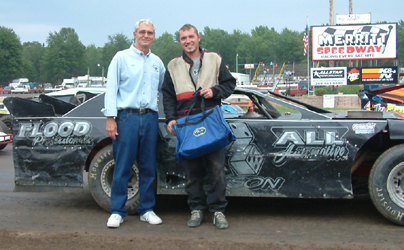 Board member Bill Walters along with his brother Richard were on hand to present our MARFC Helmet Bag to UMP Late Model Driver # 7 Adam Erickson. Adam has had his share of Hard Luck this season with blown motors and still keeps coming back and is currently in 3rd place in the points. Club member Candy Baschal won our MARFC members raffle for the evening. Great to see many folks stop by the MARFC table and say Hi. Thanks to Larry & Kenny Letts for helping at the table for the evening. Again many thanks to Rod Ancel and the entire staff at Merritt for their continued support of the club! Also to Alan Lardie for a fantastic job talking the club up all night long! 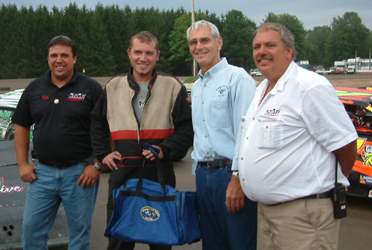 Looking forward to return to the speedway again for the 2011 season! 8-6-2010 Another fantastic night of racing was held at the Kinross Speedpark for our annual trip to the upper side of Michigan. Weather was great with a full field of modified cars in the pit area for the running of the Annual Randy Saddison Memorial race. Board member Jeff Moroni and his wife Donna were on hand to man the MARFC table and greet fans and members alike. Unfortunately our MARFC Helmet Bag presentation was delayed due to the fast pace of the nights events. Gerry Liscumb track general manager was a big help in the PR of the club all night and will present the bag at the next event and inform us of the winner as soon as possible. Many thanks to all who stopped by to chat and to all the Kinross staff members for the great hospitality! Glad to have the Speedpark as a MARFC member track and look forward to next season.